The Dance Repertoire is the heart of our cultural program led by Marife Amisi, our VP of Cultural Affairs and Rowena Aya, Assistant. We foster family involvement in the community by cultivating their enthusiasm to admire, savor and embrace the beauty of our heritage and culture. It is also an educational medium to teach and train our young children discipline, team spirit, pride and artistic excellence. As they grow as young adults, they serves as mentors and model figures for our young children. Orchestrated and directed by Edna Culig, the PASCO Rondalla is the other cultural program offered by the organization. 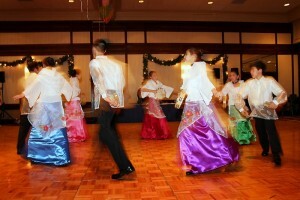 The Philippine Rondalla is a traditional stringed instrumental group often referred to as the Filipino String Band. The Spanish Rondalla which was introduced to the Philippines during the second half of the 19th century consists mainly of the bandurria, laud, octavina, guitar and bass that evolved into an elaborate instrumental group adding the piccolo bandurria, and mandola. Percussion instruments are added for rhythmic reinforcement and enrichment of texture. Also the 12-stringed Spanish bandurria was modified with 14-strings and a shorter neck and known as the Philippine bandurria. The latter instrument was also tuned a half tone higher. The popularity of the ensemble in the Philippines make it one of the most important musical trademarks of the country and is a valuable artistic medium in fostering the cultural identity of Filipinos. The Philippine’s official language is called Filipino. The Tagalog language is the basis of the Filipino national language. If you are not fluent in Tagalog and are learning the language as a non-native speaker, PASCO offers conversational tagalog class. Check with us soon for upcoming classes. The word parol comes from the Spanish word “farol” meaning lantern. 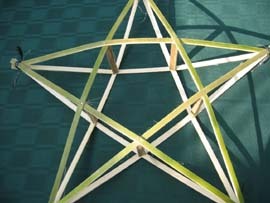 The Parol is a traditional Filipino Christmas decoration. It is a symbol of the Christmas spirit. Decorating one and lighting a parol is an expression of shared and hope. 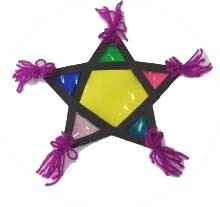 Traditionally, parols have a star-shaped framework made of bamboo sticks and are covered by colored Japanese paper (paper de japon) and lluminated by a candle. The lantern was originally used by barrio folks to light their paths to church to attend the daily Misas de Aguinaldo, which begin on the December 16th and ends with the Misa de Gallo at midnight of Christmas eve. Stay tuned for upcoming workshop this fall.